Overview : E3card Reader is a personal mass-storage security assistant. It works as a multi-function SD card reader for users. It’s your own file security expert. In basic mode, a normal SD card once accessed by the E3card reader will not recognize by normal PCs or other normal card readers. For meeting various requirements coming from different kinds of customers, lots of encryption algorithm will be released and all of them are easy to download from our official website. In general, from preschooler to senior, if you have digital security requirement, the E3 would be the best choice. Our products are easy to upgrade. Even for children (DO NOT let children under 6-years-older use this product, as they could accidentally eat the card reader and/or the SD cards) they just need to copy a file into a removable driver which named E3Upgrader by a simply Drag-and-Drop access, and then everything is done. Drag-and-Drop is a well accepted standard used by most of the desktop-based operation-system such as Windows, Mac OS (coming from Apple) and lots of Linux system. No dedicated application need to download, No complex access need to learn, and No differences among different environments, to accomplish these objects, using the Drag-and-Drop upgrading mode seems to be the only way for us to make a very friendly tools for our precious customers. Armed with an internal 4M memory stick, the ability to read/write various type of SD cards, E3 team have been trying to supply more and more functions but not only the personal file security services. We have licensing some impressive teams to get lots of good works available for our customer. And we welcome teams all around world to join us to create an exciting product. About the third-party application, please refer to our official website www.e3-card.com. E3 makes Everything Easy and Efficient. 32bit processor with 128K flash, has strong processing rate and high expand space. MicroSD SDHC supported and can load software and game from it. Multi-System supported and includes WinXP/Vista/Win7/Mac OS/Linux. This means you can upgrade and use E3 Card Reader in most OS. 4MB FLASH on-board, so you can save any PS3 software very conveniently. For example, you can copy any homebrew application. Super-Drag-Plug upgrade mode. Just copy BIN file and paste into E3 Card, finishes upgrading in 1 second. No need for any extra upgrader. Dual firmware booting mode. The latest Hermes v4b and KaKaRoTo firmware is integrated into one code and you can use any of them by yourself. No need to re-flash code. Supports any free PSGroove files like Hermes & KaKaRoTo. E3 Card Reader has CE, FCC and RoHS certification. It is a safer and environmental product and comes with 2 year warranty. IMPORTANT: The console must be completely switched off before using E3 Card Reader. For fat versions, use the switch at the rear. For slim versions, unplug power cable. This is extremely important for the process to work correctly when you start the console. Quality/Usability : The newest jailbreak device to hit the market is E3 Card Reader but they don't advertise it as one (smart). They aim it towards a card reader/storage device. The first thing to pop into you head is...it looks just like an iPod Shuffle, but it's not. It has 128k flash, works on WinXP/vista/Win7/MacOS/Linux and 4MB of programmable on-board flash. The device is made of good quality plastic. Unlike some, the E3 Card's casing consists of two pieces...front and back. They are both snapped together. So with a little force, you can easily separate both of them and expose the innards. What is E3_4M_STICK, E3Upgrader and Removable DISK? E3_4M_STICK is 4MB flash on-board memory. You can save software like managers and homebrew games onto it and then install onto PS3. E3Upgrader is specifically for upgrading. You can save E3 Card firmwares onto it and generally needs only 1 second to upgrade. Removable DISK is microSD(HC) slot shown on PC. After you insert a microSD(HC) into E3 Card Reader, the PC will show it is microSD(HC) card and then you can save any software and/or game onto it and run them on the PS3. For the 4MB on-board flash memory, not only can you load software but this is where you load ANY pre-compiled HEX file you want from any USB board whether it be Hermes or KaKaRoTo PL3. But in order for them to work, you have to rename them. For Hermes payload, you need to rename the file to "h.hex" and for KaKaRoTo's PL3, you'll rename it to "k.hex". **UPDATE 12/16/10** HEX files should now be named as "free.hex" regardless of payload. The above information was pulled from their site. However, it says that for the Removable DISK, you can "save any software and/or game onto it and run them on the PS3". I've tried leaving the microSD in while jailbreaking (causing it to load PL3) and none of the files I stored on the microSD showed up. I tried jailbreaking it first (loads Hermes by default) and than inserted the microSD and nothing showed up. Removing E3 Card Reader and than reinserting it back into the PS3 gives an unrecognized USB error message. How to update E3 Card Reader? Download E3 Card Reader firmware from download page. 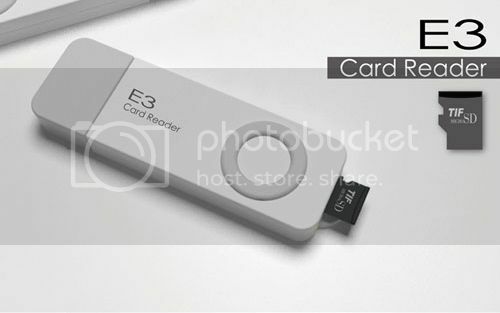 Plug E3 Card Reader into PC and it will show "E3_4M_STICK", "E3Upgrader" and "Removable DISK". Drag and drop "E3Upgrader.bin" firmware into "E3Upgrader". After you drop it in, a red LED will blink and then the blue LED on E3 Card Reader will light up and this means the upgrade is complete. Plug E3 Card Reader into PS3 just like any other jailbreak device. Cut off the power of your PS3. For the fat PS3, press the power off button on the back. If you own the slim, disconnect the power cable from the system. If you want to load Hermes payload, plug your E3 Card Reader into any of the PS3 USB slots. Be sure that NO microSD(HC) is in the slot. While booting E3 Card Reader, it will light up and flash blue and red. When the blue light is on instead of flashing, it means booting progress is over and the jailbreak is successful. You will also see “Install Package File” in the game menu. So the process is pretty much the same as all others. In order to take advantage of the dual boot, if you want Hermes payload, do NOT have a microSD(HC) inserted. If you want PL3 payload, make sure you have a microSD(HC) inserted before you boot up the PS3. Conclusion : Overall, the E3 Card Reader microSDHC PSGroove is a nice thin jailbreak device. I think the design of the dongle could have been a little better or something more unique. The 4MB of space may be a bit small especially if you're the type to hold and store a lot of files. It can fill up quickly especially in the future once developers start to get a hang of the PS3 and start to develop more for it, files will get bigger. You'll be seeing more and more new jailbreak devices with support for dual boot and microSD slot. However, now that Hermes is no longer working on payloads, dual boot may no longer be needed once there is a standard payload. Of course, you'll need a microSD(HC) in order to activate the dual boot. By now, everyone should have at least one TransFlash card whether it be from their camera, DS flashcart or cellphone. Even if you don't have one, its fairly cheap to get one and I have provided links as to where you can get them. I would of liked a spring loaded microSD slot for easy removal of SD card as I had some trouble trying to get the microSD card out with my big fingers. Once of the information provided from the E3 Card site was that you were able to save any software and/or game and run them on the PS3. I was unable to get this to work and tried many different methods. None of my files showed up. This was the same for the P3Go GT-Break II that I reviewed. E3 team has released their own downgrader! You can read more about this great news and download files can be found HERE!